Since the introduction of the Elinchrom Skyport Plus HS transceiver, and the new Hi-Sync capabilities of that transceiver, there has been a massive amount of confusion as to how this technology works even though Elinchrom and myself have put out a lot of in-depth information on the topic. As the photographer that shot some of the promo images for the new Skyport Plus HS, I am getting quite a few emails asking which flash heads to buy, how the Hi-Sync works and any number of other questions related to the latest Elinchrom strobes. Here in this blog post, my aim is to clear up some of that confusion and explain why you would want one setup or another in terms of the various flash heads offered for the ELB400 and the higher-powered Ranger RX Speed AS units. 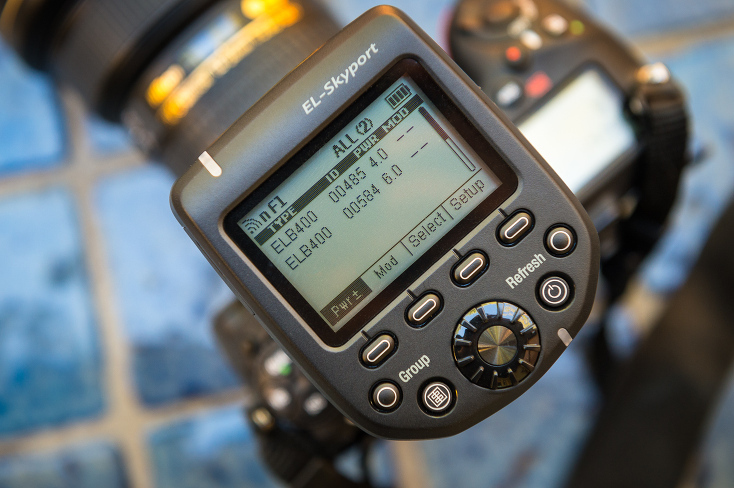 The Hi-Sync Experience: This blog post introduces the Elinchrom Skyport Plus HS and gives an overview of it’s capabilities. HS or HSS: What’s the Difference? : This blog post goes into great detail to explain how High Speed Sync, Hypersync and Hi-Sync work and how they differ. Reading this article will help you understand why and how we decide which flash head to use and for which situation each would be best. Also, the diagrams in this blog post, created by Bram Dauw at Elinchrom, are incredible and really drive home just how each of these high speed flash systems work. Now, getting down to it here. Basically, Hypersync and Hi-Sync are the same thing, but since PocketWizard has Trademarked the name “HyperSync” Elinchrom had to come up with a different name, which is Hi-Sync or HS for short. In theory they work exactly the same way. In reality, Hi-Sync works much better than Hypersync ever did or could because Elinchrom has dialed in their products to work together for the best possible results. If you want to shoot at higher shutter speeds than your camera normally syncs, like 1/1,000th second and above, then you will want to get the Elinchrom Skyport Plus HS transmitter along with the ELB400 and the new HS flash heads. A big part of the confusion with the Elinchrom strobe system, especially with the ELB400 set up is that there are three different flash heads to choose from: the Pro head, the Action head and the new HS head. As shown below, these flash heads look nearly identical save for the Action, Pro and HS labels printed on the side of the flash heads. The difference between these flash heads is the flash duration. Here, I will show which situation would be best for each flash head and why you would want one over the others. Below are the Quadra Action flash head (left), the Quadra Pro flash head (middle) and the Quadra HS flash head (right) — all of which work with the Elinchrom ELB400 battery-powered strobe pack. The Action flash head offers the fastest flash duration of the three flash heads. At full power on an ELB400, the Action head has a t0.5 flash duration of 1/2,800th second. This fast flash duration can stop motion quite effectively when shooting at the standard flash sync of 1/200th second (Canon) or 1/250th second (Nikon). If you are shooting in low light and want to drag the shutter, i.e. use a slow shutter speed like 1/15th second but also stop the motion of a moving subject then the Action flash head is the one you want. In the image below. I am showing an example of this type of image, where the shutter speed was set to 1/20th second and the aperture was set to f/5.6. The fast flash duration froze the mountain biker at the top of his jump. But, as you can see there is some ambient light bleeding through as well – this is the motion blur of the subject represented by the dark shading in front of him. He is sharp, stopped by the fast flash duration, but his shadow was tracked by the longer 1/20th second shutter speed. When shooting this type of image the motion blur is always going to be there no matter how fast your flash duration. Whether or not the motion blur is in front or behind the subject is a matter of how the flash was sync’d, either using front curtain sync (standard sync) or rear curtain sync (a.k.a. 2nd Curtain Sync for Canon shooters). Note that if you used a flash head with a slow flash duration, like the Pro head, which has a flash duration of 1/1,200th second at full power, then the cyclist would not be sharp because the flash duration was not fast enough too stop his motion. Another situation where the Action head shines is when shooting with medium format cameras, which can sync with flash at up to 1/1,600th second with no games. For this to work well, a fast flash duration is required. In fact, a flash duration that is shorter than the shutter speed being used is required so that means you need a flash duration faster than 1/1,600th second and this is where the action head comes in handy. When shooting with my Hasselblad H5D, which can sync up to 1/800th second, I use the Action head. The Pro flash head has a slower flash duration than the Action head but not as slow as the HS head. At full power on an ELB400, the Pro head has a t0.5 flash duration of 1/1,200th second. For portraits or where the subject is not moving this is a plenty fast flash duration to get sharp images. If the subject is moving then this flash duration will not be fast enough to stop the motion of the subject at normal flash sync shutter speeds, i.e. at 1/250th second or below. The Pro head can be used in Hi-Sync mode but there will be quite a bit more gradation in the image than with the HS heads discussed below. If you don’t shoot action but want a flash head that can technically work with Hi-Sync and also create nice sharp portraits then the Pro head is an option. But, honestly, if you are investing the money in this system, I would suggest buying the Action head and the HS head so that you have the best of both worlds and can choose the best flash head for the scenario. The HS flash head has a very slow flash duration and allows for the best possible Hi-Sync lighting options. At full power on an ELB400, the HS head has a t0.5 flash duration of 1/600th second, which is optimized for the least amount of gradation when shooting in Hi-Sync mode. This flash head is also designed to work at virtually any power setting and still provide very evenly lit Hi-Sync exposures. If you are looking to shot at high shutter speeds using the HS technique, this is the flash head you want. In the image above, I captured this image using the Hi-Sync mode and a shutter speed of 1/6,400th second. Using such a high shutter speed completely froze the subject so there is no motion blur at all. The BMX rider is tack sharp. Contrast this with the mountain biking image above to see how the Hi-Sync (HS) flash head can stop motion fully compared to the Action head. As you can see, each of the flash heads provide different options. For myself, I find that the Action and the HS heads are the flash heads I use on a regular basis. When shooting with my Hasselblad or shooting with a DSLR at the standard sync speed or below, I use the Action heads. When I want to shoot in Hi-Sync mode to overpower the sun for a portrait or to stop the action completely (and overpower the sun) I reach for the HS heads. There isn’t any other flash system I know of that has this type of versatility. Side Note: For the Elinchrom Ranger RX Speed AS 1,100 Ws strobe system, I would opt for the S (Standard) heads for shooting with Hi-Sync and the A (Action) heads when shooting with my Hasselblad or when shooting with a DSLR at the standard sync speed or below. With the S head and the Ranger 1,100 Ws strobe, there will be some gradation in the image because the S head has not been optimized for Hi-Sync flash techniques yet. This isn’t that huge of an issue but something to be aware of. Adding a graduated filter to the image in Lightroom can solve this issue very easily and quickly. For now, if you want the best possible Hi-Sync images use the ELB400 and the HS flash head. The Skyport Plus HS is not unlike your Nikon or Canon Speedlights in that it is a very powerful and complex controller for your Elinchrom flashes. In actuality it is much less complex than either of the Nikon or Canon Speedlights, but getting to know the Skyport Plus HS takes a bit of time and effort. Actually using the Hi-Sync flash capabilities offered by the Skyport Plus HS transmitter and the ELB400 and HS flash head can be a bit confusing. First off, I highly recommend that you download the Skyport Plus HS user manual and read it front to back. This user manual isn’t included with the transmitter but is available as a PDF download. It will fill in a lot of the blanks on how to use this transmitter. Setting up HS mode for Nikon Cameras: Setting up Hi-Sync mode for Nikon cameras is very easy. Sadly, this procedure is not covered in the aforementioned user manual. To use Hi-Sync with Nikon cameras, set your camera to the Auto FP flash mode in the custom settings menu and the Skyport Plus HS will automatically engage the HS mode when you raise the shutter speed above the normal flash sync speed. To set the camera to the Auto FP flash mode go to the Custom Settings Menu (Pencil) > e Bracketing/Flash > e1 Flash sync speed > choose either 1/250s (Auto FP) or 1/320s (Auto FP) depending on your camera. For my Nikon D4, I set it to the 1/250s (Auto FP) setting and (as shown below) for my Nikon D810 I set it to the 1/320s (Auto FP) setting. I leave the cameras in this custom flash mode all the time. Now that the custom flash mode is set up in the camera, the HS mode on the transmitter will automatically engage when you raise the shutter speed above 1/250th second. You will see the HS symbol show up in the top of the screen on the Skyport plus HS. Setting up HS mode for Canon Cameras: Setting up Hi-Sync mode for Canon cameras requires that you actually engage the HS mode on the transmitter itself. To do this, push the button below Setup and then select SYNC Mode and choose HS Hi-Sync Mode. Your transmitter is now setup for Hi-Sync. As I don’t work with Canon cameras, I have heard from a few that have tested it out and those photographers have indicated that for the best results the ODS (OverDrive Sync) settings need to be set between 2.0 and 2.5 ms. To adjust the ODS settings, press the button below Setup , then go down to the ODS Setup menu and use the scroll wheel to adjust the ODS setting to 2.5. Note that you may want to test various ODS settings with your Canon camera because each camera is a little different. With Nikon cameras, I have found that no ODS adjustments are necessary. That is it for setting up the Hi-Sync capabilities of the Skyport Plus HS transmitter. To get an accurate exposure with the flash I recommend that you calibrate your LCD screen on the back of your camera (to a calibrated monitor) and use the Histogram to check your exposure. Normal Mode: In Normal Mode the backlit screen is glowing green. Use this mode when shooting at normal flash sync speeds or when shooting in HS mode. See the above section for how to engage the HS mode. The photo of the Skyport Plus HS shown at the top of this blog post is in the Normal mode, with a green backlit display. Speed Mode: In Speed Mode the backlit screen is glowing red. This mode is designed to be used with leaf shutter lenses offered by Hasselblad or Phase One and allows for shooting up to 1/1,000th second with those camera platforms. So, to clear up the confusion, most people will always be in the Normal mode. You do not need to be in Speed mode to engage the HS function. There are a few light modifiers built by Elinchrom that can be mounted directly to the Quadra flash heads, but with the Elinchrom Quadra Reflector Adapter, all of the light modifiers that Elinchrom makes can be used with the Quadra flash heads. Even the largest light modifiers like the Elinchrom LiteMotiv Octabank can be used with the Quadra flash heads by using this reflector adapter. The Quadra reflector adapter snaps onto the Quadra flash heads as shown below. I hope this blog post clears up some of the confusion surrounding Hi-Sync and helps you get rolling with this exciting new flash technique. Hi-Sync opens up a whole new way to shoot with strobes. Essentially, we can now choose any shutter speed and any aperture and get a correctly exposed image by powering the strobe up or down. It is a very exciting time for photography! With your Nikon cameras do you lose any light at all shooting up at the highest shutter speeds like 1/4000th to 1/8000th? I notice shooting at normal sync speed and then going to high shutter speeds i lose about 4 stops of light on the subject i am shooting. The ambient i expect to drop as it should. Is that to be expected with this system? I ask because to me it isn’t much better than HSS at all because it loses nearly the same amount of light i am finding. Michael Clark - The way the Hi-Sync works you only get a slice of the light so you end up using a smaller and smaller slice the higher the shutter speed you use. With the ELB400 and a high performance reflector I can overpower the sun from around 20 to 30 feet away depending the situation. So, you do have less light at 1/4000th sec than you would have at 1/1000 sec. Generally, it just darkens the background and I just have to open up the aperture a bit to account for the difference. I am not sure how many stops of light is lost – that is very hard to measure accurately and varies with the shutter speed chosen but the background does get darker (as normal when using shorter shutter speeds). In my testing with the Profoto B1, I couldn’t get the HSS to work very well at all any more than five or six feet away from the subject, so I’d say the Hi-Sync is much more powerful. Craig Tull - Thanks ever so much for your reply Michael. It’s much appreciated and i now understand the system much better now you’ve cleared it up for me. One last question though if thats ok. Do those high performance reflectors make a big difference for throwing the light further? As you yourself shoot action sports you will understand my predicament that you can’t always have the flashes super close and sometimes you really do need to overpower the sun from 10+ feet away so will purchasing them help me out a lot? Thanks ever so much for your time Michael. Michael Clark - Yes, the high performance reflectors really help push the light out there quite a bit and they also focus the light as well. I use them often for sports photography. I highly recommend them. Of course, they are not the softest light source so if you need to shoot a portrait a softbox or umbrella might be a better tool. Just depends on your lighting needs. Craig Tull - Thanks ever so much for your help Michael. You’ve really cleared some things up for me. Alex Buisse - Thanks very much for this article, Michael! I am curious to hear your thoughts on best ODS settings to use, if anything other than “OFF”. Are you expected to work it out for each scene, using a stand-in for the model and trying different values until you chance upon the best exposure, or is there a more scientific method? I remember seeing a table with standard ODS values for cameras and shutter speeds somewhere but can’t find it anymore. Michael Clark - Alex – You shoot with Nikon cameras so I would just leave the ODS setting off or at 0, which is off. I have never found the need to use the ODS feature with my Nikon Cameras. If you are trying to get a lower amount of light on the subject at a certain power setting you can move the ODS setting and move the strip of light being used to a lower part of the flash curve but that is a pretty specific use. The ODS settings will be very repeatable if you are using them. So you can try that out at home and then just know if you want to do XYZ then set the ODS to 1.x or whatever. I think this is more a feature for Canon shooters where they have to use this just to get the Hi-Sync to work at all. Paul Kelly - Thanks for another useful article Michael, I was very excited to order my HS kit just before Christmas but have had mixed results so far in testing. How much does power setting affect any (potential) banding in your opinion? I ask as the first thing I did when I got the Skyport out of the box was to set the light/camera on stand/tripod pointing at a wall & go right through all full-stop shutter speeds at various power settings & I noticed significant but inconsistent banding right across the board with both a D810 & D4s. I played with ODS & could reduce it somewhat but it was definitely there. Also, I found that I had to go to speed mode by default as I was getting the lower banding if I went from 200th to 250th (again, Nikon so should have been fine at 250th) but I did read somewhere that anything above 200th required speed mode? Michael Clark - Paul – Great point, I thought Elinchrom had fixed that issue with going up to 1/250th sec for Nikons with the Skyport Plus HS but apparently it is still there. I will amend the article. Thanks for pointing that out. As for the banding, there is still some but when not shooting a white wall it is very difficult to see in my experience. If shooting with the Pro head then there is a lot more than when shooting with the HS head. Either way, it can be dealt with in post by using a graduated filter. What were your settings with the D810 and D4s? So far, I have used a wide variety of power settings on the ELB400 and it seems to have very little banding at any setting. The higher power settings are cleaner than the lowest power settings. I’ll have to do some testing when I get back from this next assignment as I did not test it on a white wall at all power settings. Great article, finally some in-depth explanations about the differences of the heads. but unfortunately, i’m still not sure which heads are the right for me. I’m planning to use it for outdoor sports and fashion. was thinking about buying the Pro head, so i can roughly taste both of the worlds with it (regular usage + abit of HS). but i’m not completly sure if im currect. Or on the other hand, buy the HS and enjoy its HiSync capabilities for sports – but would it limit me somehow photographing fashion? Michael Clark - Alexander – You could go with the Pro head but I don’t think you would be satisfied. I would just buy the Action head and the HS head and then you will have the best of both worlds. Thanks for another really informative article. I’ve been really interested to read your previous posts comparing the ELB 400 and Profoto B1 (which had previously been my favoured option). Having read your articles and explanations around HS and those of Quentin Decaillet on Fstoppers, I’m about to jump in and purchase the ELB 400 HS system. One question – what can’t the HS head do ? It looks as though it’ll freeze motion really well through fast shutter speeds and HS and I can’t imagine that still portraiture will pose a problem either. Presumably studio work with splash / liquid photography may be more suited to the Action head ? Am I missing something or will I be OK with an all HS Head setup ? Thanks in advance for your wisdom ! Michael Clark - Alex – The ELB400 with the HS head can do a lot but if you need to shoot at 1/250th second or slower and want to stop action then you will need the Action heads. So unless I’m in a low ambient light situation and need to drag the shutter for the ambient exposure and use the flash to stop the action, the HS Heads should be pretty good for everything but that ? I’m on a fairly limited budget so as well as using the ELB 400 system for location portraiture, I will likely have to use the ELB 400 system as my makeshift studio lights too for the foreseeable future. May I therefore ask whether you think there would be any problem in mixing Action & HS Heads in a studio type setup for doing static portraiture ? For example, using 1 head to light a background, another for hair lighting and 2 for the subject ? Likely I’d run a pair of HS Heads off 1 pack and a pair of Action Heads off another. I can’t see that this would cause problems but would value your thoughts ? Michael Clark - Alex – That could work mixing the HS and Action heads as long as you use the HS heads on the background. I typically don’t ever plug more than one head into the ELB400 packs but I typically am shooting outside. You’ll find out quickly if it works for you when you start shooting with them. Please excuse my ignorance on this matter – am I correct in presuming that the reason for using the Action Heads for the subject lighting and HS Heads for background is that the former will be better at stopping any subject motion at lower (more typical studio setting) shutter speeds whereas the HS Heads wouldn’t and in my hypothetical mixed setup would therefore be better used on the (static) background ? Or am I missing something here ? It would be really helpful if Elinchrom could publish a table comparing the suitability and pros/cos of all 3 heads for different uses/situations. Michael Clark - Yes, Alex, that is exactly correct. the HS heads on the background because it won’t be moving in that scenario. Elinchrom is working on that blog post discussing the different flash heads as we speak so there will be one soon. I’m pretty much sold on the HS head, but I’m a little confused on it’s application for portrait work. I shoot mainly portraits of subjects that aren’t moving (no dancing, no jumping, etc), just pose, and take the picture. Will the slower duration of the HS head cause me any problems when I’m syncing under 1/200 of a second while i’m in the studio (or lower light situations where I need to drag the shutter to gain more ambient)? Even if the flash is popping at around 1/500 of a second, it seems like it will still be fine. Thanks for being such an excellent resource! Michael Clark - Mark – The only issue with the HS heads will be if the subject is moving. Then the subject will be blurry is shooting at 1/200th sec or lower. The good news is the flash heads are not that pricey compared to a lot of the competitions and if you find the need for the Action head, you can add one at any time. Will these heads work with the older Ranger RX or Quadra power packs? Michael Clark - Ted – Which heads are you referring too? The HS heads only work with the ELB400. The Ranger can use the S or the A heads. For Hi-Sync with the Ranger you want to use the S heads. Firstly, thankyou for sharing about the HS, I have just purchased my HS and am having quite strong banding (brighter ribbon across the bottom) issues, I use a Nikon D750, Elinchrom SKYPORT HS, Ranger RX 1100 with S-Head…. Is there any chance you could share an unedited photo showing what banding you get!!! Michael Clark - Scott – With the Ranger S head you will have some gradations. for example it will be brighter on one side than the other. That is normal. Applying a graduated filter in Lightroom should take care of that. With the ELB400 and the HS flash heads there is very little gradation of any kind. Does the HS HEAD in hi sync mode work well at low 1/4 or 1/2 power? Most article only mention shooting at full power. I shoot sports action and not only want the hi sync but i also want my flashes to recycle fast so I can get at least 3-4 flash bursts. Michael Clark - Andy – Yes, the HS flash head works great in Hi-Sync mode all the way down to the lowest power settings, which makes it incredibly versatile! Michael Clark - Holger – The HS flash heads are a unique flash head for Elinchrom and don’t follow their standard flash duration ratings. At full power it is 1/550th second and it does vary as you lower the power. I believe at the lowest power settings it is closer to 1/1000 sec flash duration, which is still useful for Hi-Sync. As they don’t publish the exact flash duration numbers for the entire power range I don’t know what the exact numbers are. Yes, for stopping action with the HS head it all comes down to the shutter speed (for sports). If I was shooting weddings, the HS head would not be my first choice. Holger - Thank you. The HS head would be our choice for the portrait sessions (usually in bright light). We would complement it with the action head for the rest. Very concise article, I just have one question before I purchase: will I need to purchase anything additional to trigger my Ranger RX Speed AS with this trigger or does the Ranger have the receiver already built in? frank Rhubarb - Sorry Michael, that link you posted goes to Transceivers, not Receivers? Am I mistaken or is this what I need: http://www.kayellaustralia.com.au/elinchrom-skyport-transceiver-p-2834.html with this: http://www.kayellaustralia.com.au/elinchrom-skyport-ranger-adapter-p-2839.html ? Michael Clark - Frank – Yes, those are the ones. Michael Clark - Joseph – The HS heads are great for Hi-Sync use. I prefer to use the Action heads when shooting at 1/250th second shutter speed or below. I have not tried the HS heads in the studio so I don’t know how well they would work. If your subject blinked or moved even a little bit the HS heads would not stop the motion so my advice is to buy both the Action and the HS heads for the best of both worlds. That is part of why the ELB400 system is so versatile. Joseph - Thanks for the reply Michael! So say you used 1/160th shutter speed on a D810 for example, the ELB and HS head on full power (flash duration 1/600th of a second) that may not be enough to freeze a blink or even slight movement during portraits? I’m surprised slightly as when doing street photography, I always aimed to shoot at 1/500th of a second to get quite sharp pictures. I do think being able to purchase the different heads is very versatile and possibly using the action heads for the subject and hs heads for the background in certain circumstances. Michael Clark - I don’t know for sure Joseph. It might work just fine, but I haven’t tried it. Shutter Speeds stop motion much more than fast flash durations. With a D810 at 1/160th second without a flash I’d be lucky to get a sharp image. I have to shoot at 1/500th second to get a sharp image with that camera without flash – because of the high MP count. I am not the steadiest guy out there. At 1/250th second, I can get about 60% tack sharp images but that is cutting it close for me. It also depends on what lens I have on the camera. Bigger lenses require higher shutter speeds to be assured of getting sharp images. Mike Duffy - I have an older Quadra Ranger 400ws with 2 A heads… can I get these to work in HS? Michael Clark - Mike – If you buy some HS heads and use them with the new Skyport Plus HS transceiver then yes you can do Hi-Sync. Hi-Sync will not work with the A heads. chen - Hi! Thanks for the great write up! I use a canon and an old (old!) Hasselblad H2. Do I need to buy two different skyport Plus HS transceivers? on the website its just sony, canon and nikon versions…. Also with the Hasselblad, you mention get the Action Head as I can take advantage of the leaf shutter, I want to be able to shoot and freeze subjects at wide apertures – will the HS head be better with my Hasselblad? Michael Clark - Chen – The Canon Skyport Plus HS should work fine on your Hasselblad. I use my Nikon version on my Hasselblad. With the Hasselblad you want to make sure the flash duration is shorter than the shutter speed. So, yes, the action heads would be best for use with the H2. With the HS head you can freeze motion at any shutter speed you want with your Canon DSLR. It might be more effective at freezing motion because of the limited shutter speeds on the Hasselblad. But, I have found 1/800th second on the H5D and the A head to be pretty effective at stopping motion. You will have to try them out to see which you prefer. Mark - Any chance you can just use an HS Flash Tube in a regular Pro head and get the same HS results? Can’t imagine any type of built in circuitry difference between the various heads as the duration is more a result of the flash tube….. but I could be wrong. Michael Clark - Mark – I don’t know. Interesting idea though. Let me know if you test that theory out. When you say “below”, do you mean faster, not slower? When photographers use terms like higher, lower, above, below to describe shutter speeds or aperture, I find it can get confusing at times. For example, when discussing shutter speed, does the term “higher” refer to a higher speed or a higher number (eg. 1/250 > 1/500). Also, terms like above or below can be perceived differently depending on whether it is relative to the fastest or slowest shutter speeds. Another example, does a higher aperture refer to a higher f-stop or a higher, greater amount of light? Personally, I find terms like faster, slower, longer, shorter for describing shutter speeds and brighter, darker, wider, narrower for describing aperture all less ambiguous. Of course, there are a number of other terms used, such as dragging, which have a clear meaning but other terms I find ambiguous. Maybe it’s just me. Michael Clark - Harvey – Thanks for pointing this out. I mean that when using Action heads, which have a fast flash duration, they are great when shooting at the standard shutter sync speed, i.e. 1/250th second on my Nikons, or at any slower shutter shutter speed, i.e. 1/10th second. This is because the fast flash duration will freeze the action. The HS heads are for using shutter speeds that are faster than the 1/250th second flash sync, i.e. 1/4000th second. The HS heads have a very slow flash duration – only 1/550th second (compared to the 1/2000th second and faster flash durations of the Action heads). Hope that clears it up. Adrian - could anyone help me with my question, that is can I connect my nikon sb 700 with elinchrom HS head used with transmitter skyport plus HS as would like to see if I could use the speedlights as a second flash . Michael Clark - The only way to do this is set the ELB400 to slave mode and then when your SB700 goes off (attached to your hot shoe) then the ELB400 will go off but you will lose the HS capability of the HS flash head. Alternatively, you could buy one of the less expensive Elinchrom sky ports and trigger the Speedlight with it in the Skyport hot shoe. I would suggest contacting your camera store or Elinchrom for more advice. Adrian - ok michael thanks for that , I have a set of pocket wizards(king x) and a elinchrom skyport plus and out of all of it I am sure I will get something to work . George Hatzipantelis - Cannot get my canon 5d mk ii to sync the transmitter. Michael Clark - Not sure what to say. I shoot with Nikon. I know lots of Canon shooter’s have been working with the HS heads on the ELB400 and have gotten it to work very well. I would contact Elinchrom and see if they can solve your problem. Also, if you are working with anything but the ELB400 and the HS heads for it, that might be the issue. Scott Maddern - I just got the skyport plus and ELB 400 with HS head. I have my D800 set to 320 auto FP. The skyport shows the HS on screen. When I use above 1/800 or so, power drops to produce black image. I have my Nikon set to F 2.8, and light is on full power. Light is on top of subject. What am I missing? Michael Clark - Make sure you are in the normal sync mode – the Skyport Plus HS should be glowing green. And it should be a Skyport Plus for Nikon. The power is not dropping on the flash. You are just using a slice of the light produced by the flash head. Adjust your settings and the flash output until you get a good exposure, which you will have to judge by looking at the LCD on the back of the camera and using the Histogram. Also, crank up the ISO if needed depending on your shooting situation. Start out with the light at full power and relatively close to your subject (5 to 10 feet away) and just using a standard reflector. Scott Maddern - I should have mentioned that I did confirm normal sync mode. Yes, Skyport for Nikon. It was a sync issue. It went from 1/800 sec being ok to 1/1000 mostely black. I saw the sliver of the frame (that was getting exposed from the light) getting over exposed when I raised the ISO. It was wonky. I turned everything off, had diner, came back to do more tests and now no issue going to 1/8000 on less than half power (2.5 or so). I did not change a thing except power everything down. I will continue to test over the next few days. Thank you for responding to my question. Hopefully just a fluke. I believe my issues stem from attempting to use two lights simultaneously with Hi-Sync (elb-400 with HS head + quadra RX with Pro head). When I reset everything and use only one HS head, it starts to work. Before I buy a second HS head, do you know of issues using more that 1 light with this technology? Michael Clark - Scott – There should be no issues whatsoever using more than one pack and head with HS. I was just shooting with three of them. Using different flash heads (i.e. Pro and HS) might have some issues because they have different flash curves – meaning different flash durations. I would say that is the issue you are facing. So, getting another HS head should take care of that. Per - Hi do you have some images that you shoot with your hasselblad and action head that we can see? And did you try the pro head with same system? I dnt shoot movement bu like darkening background. 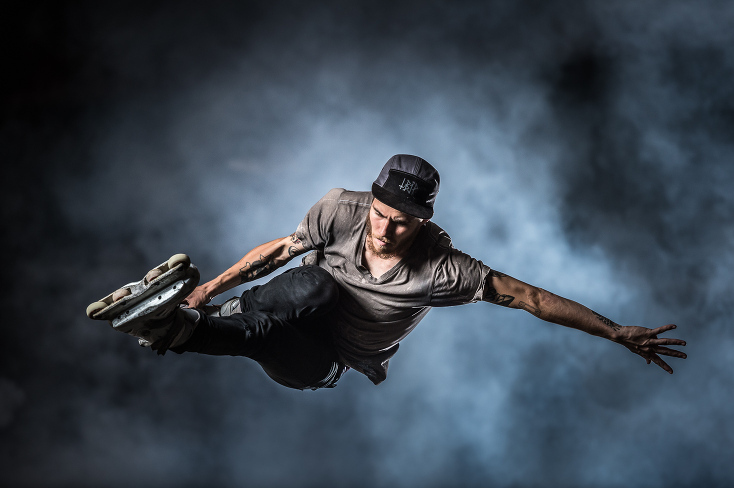 I would like to get another light in my system for hair or to emulate a sn from behind to go with tye dark background effect like the photo portrait of the skater. Michael Clark - It sounds like yes, another HS head is what you need for that. I’d go for the HS head as you can’t use HS and a speedlight together. HS is very specific and the Speedlight won’t show up if you are triggering in HS. power converter outside for Hi-Sync? Is there a limit on how may HS heads i can use with Skyport? Michael Clark - Bala – I am guessing you can use that setup. I haven’t tried it but the GODOX is just a battery so it should work fine. You can have up to ten different flash heads with the Skyport Plus HS as I understand it. Bala Krishnan - Thanks Michael. I really envy you…. Bala Krishnan - Can you provide a scenario how i can use Action Head outside in full daylight to freeze action? Or can action head be used only inside? Like you BMX shots, but using action head. Is it possible? Michael Clark - Bala – You can certainly use the action heads outside – you just have to stay under your cameras normal flash sync, which means you typically need way more power to over power daylight. Usually around 1,000 Ws or more. Bala Krishnan - I am tad confused. If we use way too much power outside and keep the sync within 1/200, would we have to use small aperture settings? Can you explain further if you don’t mind? Assume Sunny Day, Ideal Settings ISO 100, 1/16 and 1/125 Speed. I am have Elinchrom BRX 500 (2 Units). Michael Clark - Bala – Yes, if you want to overpower full sun in the middle of the day at 1/200th second that requires using an aperture of f/11 or so. his is basic flash exposure stuff. I suggest trying it out on your own and experimenting. Scott - Some advice please…. I have been using an S head for the quadratic which can overpower the sun, 1/200, F16, ISO 100 e.g.. I use this for groups at weddings when bright sunlight means back to the sun for the groups and filling with the quadra. However I have recently bought the HS head and if I’m understanding things correctly I can do similar with higher shutter speeds and easily over power the sun. My question is around advice for the larger groups. Can I do something with the two lights (I only have one Quadra pack and know it splits the power between the outputs)? Michael Clark - Scott – yes, you can use as many flash heads as you want with multiple packs. I have never lit a huge group like that so i don’t know what the best modifiers would be. I would suspect you would need way more light power (an ELB 1200 or multiple ELB 1200s) and use the biggest soft boxes you have. Also, be aware, when using HS you usually end up with a smaller aperture – say f/5 or f/5.6 so that may not be enough depth of field to keep everyone in a large group sharp. Randall - Hi Michael, has anyone tried mixing the pro heads with the HS heads and then shooting in HS mode? If so, I’m wondering what the result would be? Michael Clark - I don’t know. I am sure it could work but it wouldn’t be optimum. Michael Clark - Carl – If you want to use the Hi-Sync capabilities of the ELB 400 you will have to use the HS flash heads, not the action flash heads. I know that is counter intuitive naming. With the Action flash heads the fastest shutter speed you can use is your top flash sync speed on your camera, 1/250th for Nikon, 1/200th for most others. Also, to do Hi-Sync, you will have to use the Skyport Plus HS. See my other Elinchrom articles on my blog for more info on that. Michael Clark - Carl – In my opinion, Hi-Sync (HS) is way better than HSS. You might rent an ELB 400 with the HS head and try it out before going the HSS route. Carl Jackson - Thanks, got it now. Need to get the hs head and a Skyport, guess the bonus is I can use the Skyport with the rotalite I am looking at too. All your flash head suggestions in the article and comments have been around the ELB 400. Would you give the same advice on flash heads for the ELB 1200? I can get an ELB 1200 with a Pro head for a good price, but not sure if that head would have the same situations as what you have described for a Pro head on the ELB 400. Michael Clark - Glenn – Yes, I would give the same suggestions for the ELB 1200 as for the ELB 400. I have HS and Action heads for my ELB 1200 and for my ELB 400. The Pro is a hybrid which can do both but isn’t optimized for fast flash durations or for HS. Have you used elb 400 action and has head together? Do you know what situations you can use them together and which one would not work so well. I was thinking shooting with medium format camera and head head as the main and the has head for background. Would that work on location and studio? Per - Sorry for the mobile phone autocorrect. Action head as main and hss head as background light. Michael Clark - Per – The ELB 400 does not have an HSS flash head, just the Hi-Sync (HS) flash head. No, I never use both the Action and the HS flash head at the same time. I am either using and HS set up or a setup with the Action heads. Mixing them will not work because of the different flash durations. If you are shooting below your sync speed then you want the action heads. If you are shooting above your sync speed then the HS heads are the way to go. Per - Okay so there is no way to get them to work together ? Michael Clark - Nope. They are not designed to be used together.